Where Have All the Good Beaters Gone? A year ago—in this very preview—we ranked the top six college beaters in the Northeast. For a region with a lengthy legacy of producing some of the highest-quality beating in the country, this was a rather easy task. The only difficult part was deciding who was not worthy of mention. In the end, ranked beaters Perry Wang and Steven Belitzky of the University of Rochester outplayed ranked beater Max Beneke of Boston University in the 2017 Northeast Regional Championship final on their way to a national title. But last season’s beater rankings have been heavily depleted. Of the six ranked, only two—Belitzky and New York University’s Janice Lu—remain on college rosters entering this weekend, with Belitzky’s eligibility a result of an extra year of school. That does not include Tufts University’s former starter Andrew Bittles, who graduated, or RPI’s Fiona Wisehart, who is recovering from a knee injury. The void created by a near region-wide transition year have already shown in results. Perennial contenders Boston University and Tufts have both looked lost at times as they look to find their next top-tier beaters, with the Terriers already suffering blowout losses to the University of Virginia, New York and RPI, and the Jumbos handed their worst-margin of defeat to a college team in the modern quidditch era, a 170*-30 drumming by Virginia. RPI, meanwhile, was kept in range by Emerson College, which is still transitioning after the graduation of Leo Wu. It should come as no surprise that in a region defined by its beating, the likely favorites are the two teams with returning players from last year’s list. New York, in no small part thanks to the play of Lu, have looked dominant during an 8-0 start to the season. Rochester has looked less so, but will also be pairing Belitzky and Tim Kwan—the two parts of the team’s beating triumvirate last season that were willing to exert themselves—for the first time all season; a pairing that was capable of dominating a national final, never mind a regional tournament. But beyond the teams returning top-tier talent at the position, there’s a wide open field for the next generation of beating talent to step up, and some have already begun to in the six-week stretch embarrassingly called a fall season. Ali Husain has begun to take steps towards effectively replacing Beneke at Boston University; Antoine “Frenchie” Giron has brought a take-no-prisoners style to New York; and Harvard University is relying heavily on the play of Michael Cheveney, who got plenty of reps for the Boston Night Riders this past summer. Just how far these players have developed could end up having a massive impact on the ceilings of their respective teams. New York—yes, their official athletics mascot is the Violets—has developed a reputation for always being the bridesmaid and never the bride. In three of the past four regional championships, the team has made at least the semifinals. In 2014, they went all the way to the finals before falling to the hot hand of Tufts’ David Stack in the finals, losing 260*-160. This past season, they were considered co-tournament favorites before an early injury to star ball-carrier Frank Minson and a SWIM loss to Boston University in the loser’s bracket final left them on the outside looking in (once again). But this season, as the team returns much of its core while the region is in transition, may be the program’s best chance ever to finally nab the elusive Northeast Regional Championship crown—a title that has eluded all New York City teams up until this point. Minson has returned after recovering from injury and a brief hiatus when he played for The Warriors, and will once again team up with Landon Garfinkel, who took over most of the team’s ball-handling duties in Minson’s absence. Garfinkel and Minson are lightning and thunder with the quaffle in their hands, with Garfinkel using his agility to keep himself off the ground while Minson brings brute strength. Currently, there is no other quaffle pair in the region that can compare to them, a massive advantage in a world where more and more teams are stuck relying purely on hero-balling. Of course, that strong quaffle play would be all for naught if the team could not at least compete in the beater game, but New York is more than sufficient there as well. Lu is as aggressive as they come in the college circuit. She doesn’t fear physicality and can rip bludgers from the grip of almost any beater. Her partners, Jeff Ebner and rookie Giron, are quick and agile, complementing Lu. What’s particularly interesting about this beater core is that it has rarely been outplayed this season and even in the fleeting moments where they are getting outmatched, they have a knack for minimizing the negative impact. New York has always been a team known for intelligent beaters and this season is no different. This New York team is unlikely to simply run away with the title. There is simply too much talent on the other top squads, and it’s undoubtedly going to take some breaks going the Violets way. But New York’s chances are as strong as they’ve ever been, and anything less than a title will likely be seen as a disappointment. Alright, let’s get this over with. The minute The Rogues announced they would be competing in the Northeast—driving the final stake into the heart of a potential Northeast and Mid-Atlantic Club Superregional—the now-existent Northeast Regional Championship club division became an instantaneous snooze fest. And while it may be good news for club players who no longer have to travel further for qualification rituals that have no stakes—especially those that are also coaching college teams—it’s a real bummer for the neutral observer. A hypothetical superregional would have had four teams from our current Top-10 rankings, with a fifth just barely missing out. Instead, this tournament has two defined tiers: the Bosnyan Bearsharks and Q.C. Boston competing for the title; Rochester Hailstorm cruising to the third bid; and The Rogues and the Atlantic Dragons facing off for pride and a front-running position for a Northeast at-large bid. No game between tiers is likely to be in-range, so you can cross off 16 games immediately. If you consider the two games between The Rogues and Dragons as consolation matchups, you’re left with a grand total of two watchable matchups. Those two games, the nominal regional title match between Bosnyan and Q.C. Boston, feature the 523rd matchup involving this group of players playing with or against each other. And that matchup includes a team who cares so little that it’s playing two US National Team players out of position this season. This could easily end as a 1-1 tie that leaves a regional championship title—once again with no meaning—to be decided on tiebreakers. Maybe someone gives Hailstorm a scare for the third bid if they massively underperform, but even if they do there are so few club teams and so many club nationals bids that all five of these teams could easily go to nationals if they want to and schedule smartly. So, really, even that doesn’t matter. But hey, at least the weather’s nice in Rochester. A season ago, Rochester won a national title on the back of a dominant two-male beater set and the unstoppable—at least in the college division—quaffle play of Basem Ashkar. On the outskirts of that title run were the contributions of freshman Justin King, who backed up Ashkar early in the tournament before taking a large number of reps as a point-defending chaser as the day wound on. But with Ashkar gone, the keys to the offense have been given to King, who debuted this season at the Nittany Invitational after missing out on Turtle Cup. Without King at Turtle Cup—and admittedly touting a 12-player roster—the team managed just 60 quaffle points in their games against middling Mid-Atlantic opponents George Mason University and the University of Richmond. The numbers looked better with King on the pitch at Nittany Invitational, including 160 quaffle points against Syracuse University and 140 quaffle points in an overtime win over Philadelphia Freedom Q.C. But just 60 quaffle points in their most competitive matchup of the day against Penn State University continued to beg the question of whether this offense could reach the highs of a year ago. There is no doubt that the athleticism is there for King, who was already physically competitive on the sport’s biggest stage in his first year. But the transition to primary ball carrier is about a lot more than physicality, and to have to do it on a defending national championship team—with all eyes on you—is that much harder. All of that being said, the two-male beater set has always required a dominant ball handler to make it function at its highest level, a fact that coach Ethan Warren likely knows all too well. And if King is going to be able to be that for the Thestrals, it’s time to put up or shut up on his home turf at regionals. There has been a trend in the passing of the Great Lakes Regional Championship title: The team who took second the year prior has won the following year. It began when University of Michigan defeated BGSU, which then defeated Ball State University, which went on to win the title last year. There are two ways this trend could stay alive, but one holds more weight than the other. Miami University took second place last year, but Central Michigan University played Ball State in the round robin de facto championship game. The two MAC schools are not just destined to win the title, but are also favorites to do so. Miami is the frontrunner based on both this and last season. At USQ Cup 11, Miami bowed out just barely in-range to UCLA in the Sweet 16—further than any other Great Lakes collegiate team. During the regular season, they were never taken out of range by a collegiate opponent and consistently able to match teams on the club side like Ohio Glory, Lake Erie Elite and Rochester United. This year, they come into regionals holding a win over the team most likely to take the title from them: Central Michigan. Central Michigan is much more equipped to compete in a round-robin tournament than last year. They retained a majority of their key pieces and have added a few impressive rookies. An extra year for players in the program and a dedicated non-playing coach has all the signs pointing to Sunday at 4:45 p.m. deciding first and second place. The difference between the two teams comes in the beating game. While both have top-end veteran talent, it will be how the second and third lines can play throughout the weekend. The more players like Central Michigan’s David Banas, Allison Cale and Matt Long that can stay off the field until the last time slot, the better their chances. On the Miami side is Derek Brantingham, Paolo Federico-O’Murchu and Elena McDonald, all of whom will need to play big minutes. Not much separates the two teams, and, thus, the championship game will likely come down to a snitch catch. Last year, Ball State took the regional off the hot hand of seeker Nathan Ellert; expect the hot hand–but this time of Miami or Central Michigan–to prevail again. The most divisive thing in the region this season was the announcement of the regional gameplay format. The main arguments against it were based on safety for current players and how the weekend would affect programs in the future. While both of these points are valid and things that need to be considered, this format leaves no room for a deserving team to come up short or a team to luck out into a bid. This weekend is deciding which teams should be competing for the national championship. While the factors above are important for the growth of the sport as a whole, that is not the specific focus of the weekend. Playing 10 games is a lot, but it is how many games any team is expected to play with a national title in mind. It is how many the University of Rochester and University of Texas played last year. What about the teams without title aspirations? This should be a good test for how they could fare when they get there. It is great experience to see where you need to get your team to be able to compete for a nationals’ burden of games. 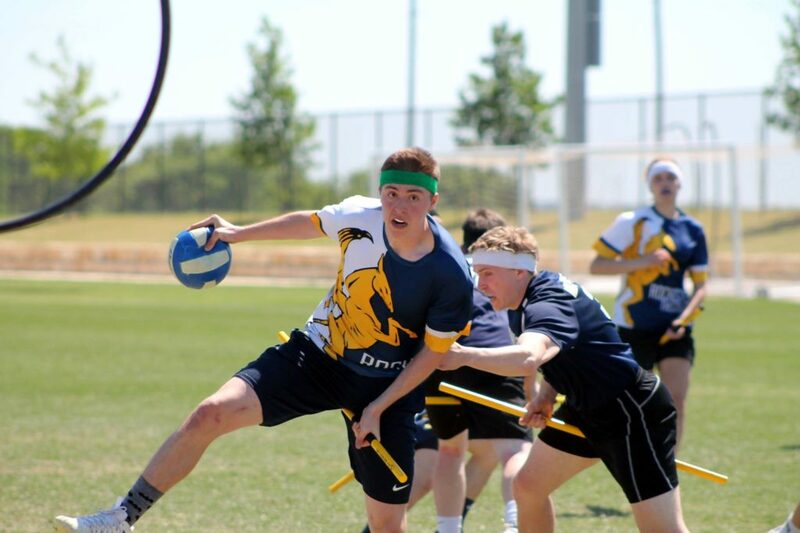 The team constantly used as the counterpoint to the “this is a good test” argument is University of Toledo—a revamped program that fizzled out following, ironically, a pool-play style regional championship. In reality, Toledo is exactly the sample to show round-robin is the better move. Additionally, it’s worth noting all 10 college teams who competed in the round robin format last season were retained. There were exciting games all day and no team left without playing a game in-range. The same cannot be said in the pool-play format, where most games featuring the top and bottom teams in a pool are well out-of-range and barely watchable. 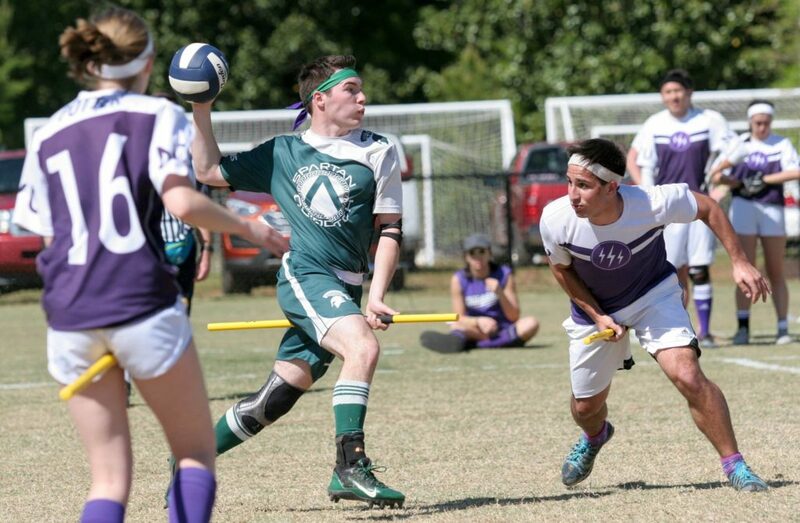 This round-robin format not only tests a team’s ability to play in the national championship, but it also offers teams opportunities to compete at a realistic level for them. It is not a secret that there was a volunteer problem in the Great Lakes at the start of the season. It was largely based on a lack of head referees, which meant there was a high chance teams wouldn’t be able to get official games in. Thanks to the efforts of many in the region, this issue has been mostly resolved. The biggest reason for the lack of volunteers was not really addressed, though: The disappearance of community teams. 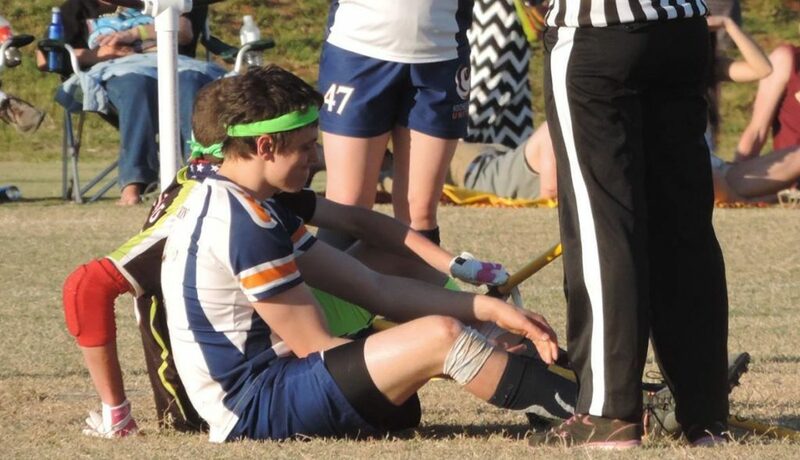 Club players are typically the most experienced and usually the most willing to volunteer. With no club teams in the Great Lakes and no experienced college player stepping up, there is no one able to fill the role of officials at the Great Lakes Regional Championship. 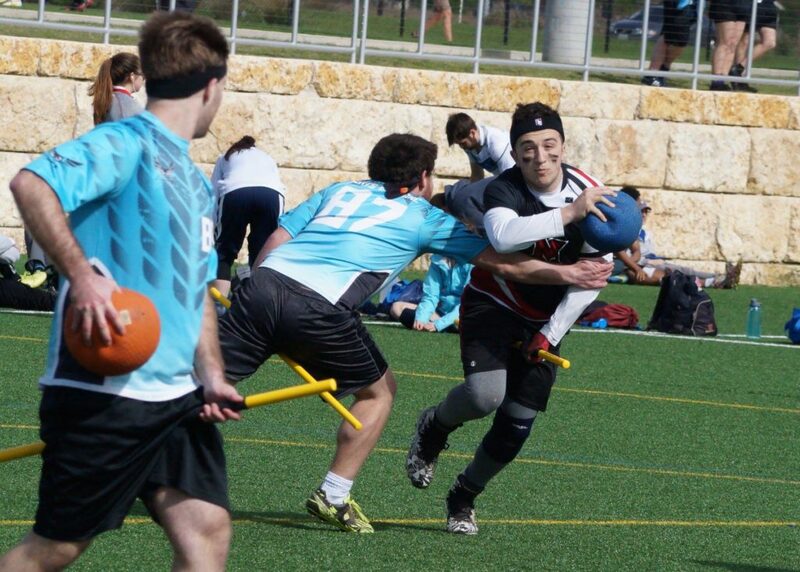 For example, the Saturday officials schedule has 18 spots in the snitch runner column filled by a team rather than an actual player. This means that teams will likely give the assignment to someone that can afford to expend energy. While that does not guarantee a drop in talent, it certainly opens the door for quick catches and short game times. 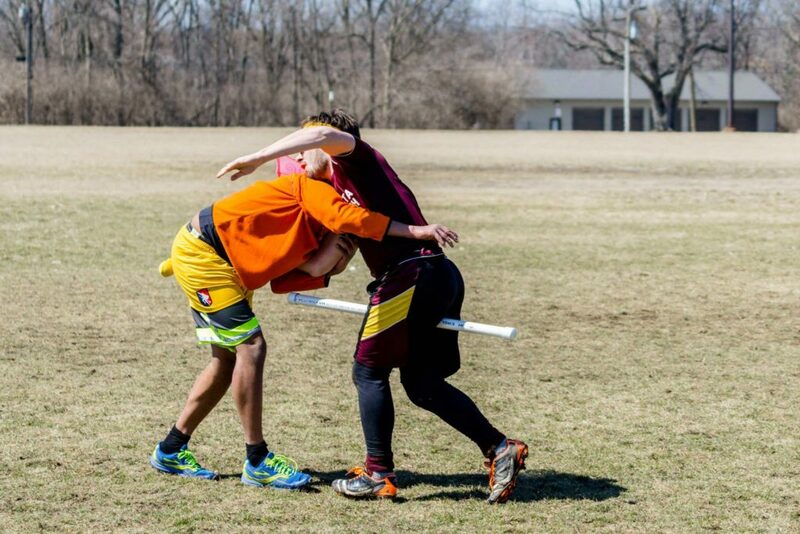 Last year, a single snitch catch was the difference for the placement of the second to the eighth place team. Last year, those positions were held by a neutral third party—thank you, Adil Abdalla. This year, it is a requirement and one that could easily influence the end results, costing some teams a bid.